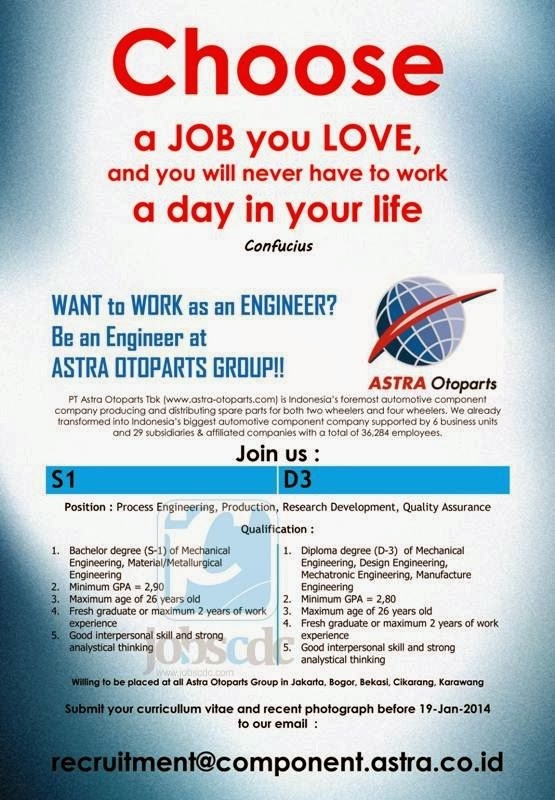 Loker Astra Januari – PT Astra Otoparts Tbk is a leading automotive component maker in Indonesia which is already established since 1976. The Company running business in producing and distributing automotive spare parts for both two wheelers and four wheelers. PT Astra Otoparts Tbk is a member of publicly listed diversified group PT Astra International Tbk. At present, Astra Otoparts has 6 business units and also supported by 33 subsidiaries & affiliates. During 2013, Astra Otoparts accepted a number of awards and accolades to appreciate its performance, among others “Indonesia Most Impactful Brand Activation 2013 Award”, ” Frost & SullivanIndonesia Excellence 2013 Award”, as well as “Indonesia’s Best Public Companies 2013”. Jobelist.com - Powered by wordpress - 14 queries. 0.951 seconds.